Abbas accepts French bid for talks on the ”Obama vision” and throws the diplomatic ball in the courts of Netanyahu and Obama as ”UN option” fades. Palestinian Authority Chairman Mahmoud Abbas has accepted a French bid to resume talks with Israel on the ”Obama vision” and throws the diplomatic ball in the courts of Prime Minister Binyamin Netanyahu and U.S. President Barack Obama as the ”UN option” fades. Abbas said he accepts in principle an offer by French Foreign Minister Alain Juppe for "talks about President Obama's vision ...in which he spoke about a (Palestinian) state with the '67 borders with borders with Israel, Egypt and Jordan." “Neither side would carry out unilateral actions” under the proposal although Juppe admitted he is not overly optimistic. Abbas has made it increasingly clear for more than a year that he will not budge from any of his conditions for establishing the Palestinian Authority as an independent country. 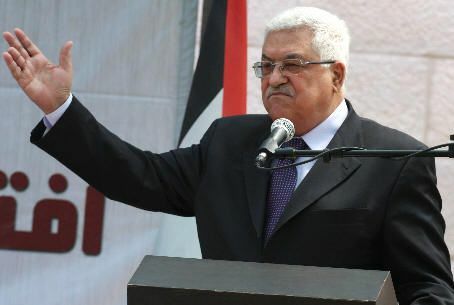 The Bethlehem-based Ma'an news agency, closely affiliated with the Palestinian Authority, reported that Abbas and his aides have come to the conclusion that the ploy to establish a state through U.N. recognition is not working. The General Assembly, where the Arab world enjoys a majority, cannot vote on the motion without a prior agreement from the United Nations Security Council, where the United States might veto the proposal of pre-determining PA borders based on the temporary 1949 Armistice Lines that ended with the Six-Day War in 1967. Prime Minister Netanyahu has not said whether he would accept the French initiative, nor has the United States, which would lose its assumed position of the catalyst for brokering talks between Israel and the Palestinian Authority. The French plan adopts President Obama’s proposal to use the 1949-67 borders as a starting point for negotiations, which is different language for basically the same proposal that the Arab world has rejected for years by placing pre-conditions. Abbas previously has demanded that no talks with Israel be held without a building freeze for Jews in contested areas and an understanding that the 1949 borders are a foregone conclusion. His sudden about-face by accepting the French offers saves him from taking the blame as the “U.N. option” becomes impractical, but Hamas, now officially a partner in the Palestinian Authority unity government, already has criticized Abbas’ acceptance of the French offer. Ostensibly, Abbas has jumped down from a high ladder, but he may find himself flat on the ground. Any compromise on his demands, which he has written in stone, would not be acceptable in the Arab world. On the other hand, if he stands on his platform, he will be seen by an increasing skeptical media and American officials as being insincere.